Scientists have just made a tremendous discovery that could expose the truth about our own history, and how modern man came to be. A major discovery in central China could totally change how we think about ancient humans, and it was all based on an anlysis of skulls found back in 2007 and 2014. 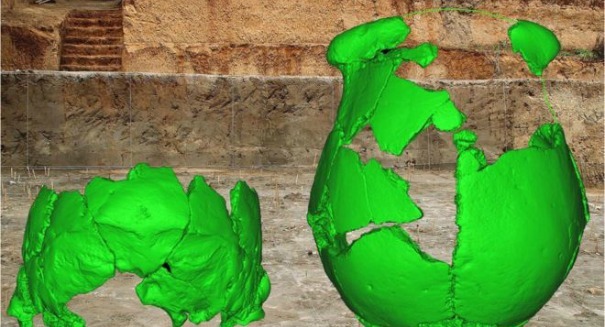 Researchers announced in a paper published in the journal Science that they believe two skulls found in Lingjing, China are between 100,000 and 130,000 years old, and they have a fascinating story behind them. The skulls are interesting because they appear to have the ear canals of Neanderthals, but have brainpans that are low and flat like eastern Eurasians, with some resemblance to Old World humans. That means these skulls seem to belong to a completely new species that is neither Neanderthal nor human. They could be Denisovans, an ancient cousin to humans that may have interbred with both Neanderthals and humans. It’s a major finding because it could shed a lot of light on the strange dynamics of human and Neanderthal relations, which scientists have been trying to understand due to the fact that we still have a lot of Neanderthal in us today from interbreeding. The full statement from the Washington University in St. Louis is below. Excavations in eastern Asia are yielding information on human evolution and migration. Li et al. analyzed two fossil human skulls from central China, dated to 100,000 to 130,000 years ago. The crania elucidate the pattern of human morphological evolution in eastern Eurasia. Some features are ancestral and similar to those of earlier eastern Eurasian humans, some are derived and shared with contemporaneous or later humans elsewhere, and some are closer to those of Neandertals. The analysis illuminates shared long-term trends in human adaptive biology and suggests the existence of interconnections between populations across Eurasia during the later Pleistocene. Two early Late Pleistocene (~105,000- to 125,000-year-old) crania from Lingjing, Xuchang, China, exhibit a morphological mosaic with differences from and similarities to their western contemporaries. They share pan–Old World trends in encephalization and in supraorbital, neurocranial vault, and nuchal gracilization. They reflect eastern Eurasian ancestry in having low, sagittally flat, and inferiorly broad neurocrania. They share occipital (suprainiac and nuchal torus) and temporal labyrinthine (semicircular canal) morphology with the Neandertals. This morphological combination reflects Pleistocene human evolutionary patterns in general biology, as well as both regional continuity and interregional population dynamics. Here is a statement from Cell Press on another recent study that came to a fascinating conclusion about Neanderthals and humans.